I've been reading Jane Austen's Pride and Prejudice to my ten-year-old daughter. I admit it was immediately motivated by my desire to watch with her the BBC mini-series, which the book was clearly written in order for them to produce one day. There's a rule here that they have to do the book before they do the movie. Well she still reads too slowly for me to wait, so I'm reading it to her. We're both loving it - I have the actors in mind as I try to emulate their voices for each part. She is enjoying it almost as much as I am. She has a set of paper dolls of Jane Austen characters, which she has enjoyed because of the beautiful costumes and general loveliness. But paper dolls are rather two dimensional - in the most literal sense. So, we're breathing life into the characters by placing the characters in their rather more interesting literary world, by reading the novel. I find I must explain some of the social rules to her as we go. There was serious protocol for every public interaction! But the behind-the-scenes behavior of the characters reveals to us that however dignified a time in history, a culture in the world or a rank in society appears, human character, in its strengths - and especially weaknesses - has always been a constant. People in Austen's world (always those wealthy enough to have leisure time) dressed up to dine and then sat around together watching television. Just kidding, there wasn't television then. You could say that in Jane Austen's world, ladies did not watch television; they were the television! That seems almost to be the whole point of their existence (the point of men's existence is unclear). Young ladies became "most accomplished" in playing the piano-forte and singing, in painting and crafting pretty (and marginally useful) things for the entertainment and enjoyment of those around them - and often for their own vanity. I'm not making a judgment as to whether this is a good or a bad thing. I mean, in our world, we binge watch T.V. shows on the internet; who are we to judge? 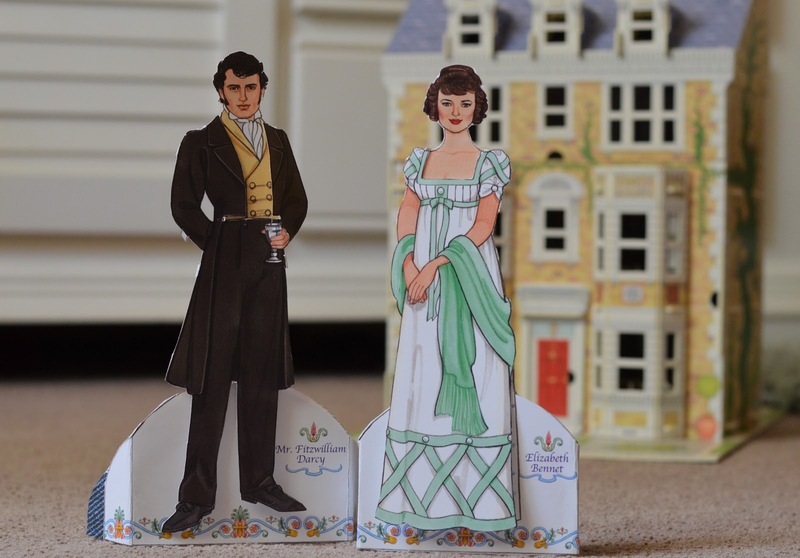 Austen's people also played cards, took a turn about the room to show their figures to greater advantage and, very occasionally it seems, read books for entertainment. I can only assume that there were men who knew how to perform musically, but mainly, we hear about the ladies. They played well or ill - and there was nothing you could do about it. You had to sit there and listen. In addition to the value in the musical entertainment itself for a social group, a lady's talent provided material for others to discuss her worth when she was not present. Electricity and recorded music not having been invented either, ladies also provided the music for dances. And, since social media wasn't a thing yet, dances were essential for meeting, watching and gossiping about one's neighbors, old and new. Just like us, they were not too dignified to pick apart their friends, acquaintances and strangers at the smallest provocation. The internet simply allows us to judge people even more remotely. And then there's that business we read about in many old fashioned books of ladies having days when they went calling and days when they received visitors. They did their work in the morning (those low enough to have any work to do) and in the afternoon they changed into a nice dress and sat in the parlor waiting for other ladies to visit. This set me off thinking about what it would be like to live in such a well-regulated society. I'm sure I'm not the first person to apply my mind to how to work this system to my advantage. Naturally, the first thing to do is to find out when everyone else is receiving and visiting. Then you make sure you will be in on the same days as the ladies you don't want to have to visit with. However, that means you may run into them at someone else's house on your visiting days. But the chance is slimmer. If she succeeds in attracting many people to her house on her receiving days, then, chances are, you will run into everyone else there. So, you should plan accordingly and try not to display any visible flaws, physical or behavioral - because people need something to talk about. If you are more inclined to a quiet gathering, you may prefer flavorless biscuits at the home of a quieter lady. She will probably appreciate the company more than the other - unless she deliberately scheduled her receiving day at that time in order to deter visitors. If you are one of those who longs for simpler days of highly regulated social behavior, when roles and intentions were much more clearly communicated than they are today, and therefore people were better, I advise you to pick up a Jane Austen novel to discover that behind the long gowns and country dances, real people in every age have struggled with the same weaknesses we struggle with today. People have always been pretty much the same. Ages and societies are not good or bad, virtuous or evil. The battleground is in the heart of each individual born. It is a never ending battle throughout each and every life and is true for every person from Adam to the last man standing. I often cringe when I hear someone explain that those people of a time long ago didn't understand this or that like we do today - as if they simply didn't think. Or when tales of times past cast the heroes and villains as all and only good or evil. Or that those living in a place more burdened with poverty or war, who perhaps lack every technological advantage we expect in our society, do not suffer just as acutely as I would at the death of their child or the bombing of their city. That just because they haven't electricity, they may not feel the fear or jealousy or joy that every human person has experienced from the beginning of humanity. Just one of the many benefits of reading great literature (especially that written long ago not just set in the past) is that in it we see that people of every time have struggled to answer the same great questions, to overcome the same sins and pettiness as we do today. Well-written stories bring to life the human drama that iss played out in every age, in every heart. The same can be said of well made accurately portrayed historical films. It is good for us to see that mundane human emotions felt by us today were likewise felt by people remote from ourselves in culture and time. It reinforces in us in an experiential way the reality of the dignity of the human person. We are just like them. Great literature has come to be known as great because it has endured - for hundreds, even thousands of years. We have it now because it brings to life the drama within the human heart and shows us ourselves. Through it, we are lead to more fully appreciate the dignity of our neighbors, past, present, and future. The complete list of great works of literature is too long to include here, but the upside of that is that you never need be at a loss for something to read. There's Homer, Dante, Chaucer, Shakespeare, Coleridge, Austen, Hugo, Dickens, Dostoyevsky, and so many more! As time marches on, more great works are added - though their greatness will be determined by their durability. So, if you have not done so before, pick up some great literature and become a student of three dimensional human character, and grow in respect of the dignity of the human person through delightful stories that reflect the virtue and ridiculousness of us all.